Trapunto Celtic Stipple 7 - 3 Sizes! Make a beautiful quilt or pillow with these trapunto stipple designs. Instructions are included. Includes 6x6, 8x8 and 10x10 sizes. 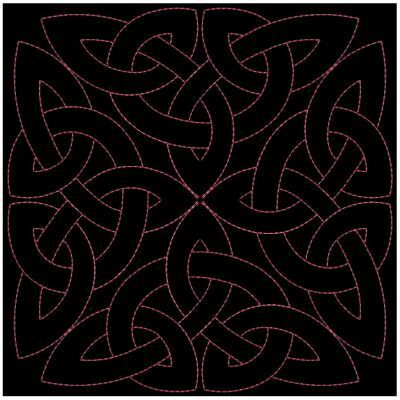 Trapunto Celtic Roses Quilt 2 - 9, 3 Sizes! Trapunto Celtic Stipple Set - 3 Sizes! Finish Size 5.90" x 5.90"
Finish Size 7.87" x 7.87"
Finish Size 9.64" x 9.64"
This design is also available in a larger set. Just click on the "Trapunto Celtic Stipple Set - 3 Sizes!" link in the "You might also like" section for more information.